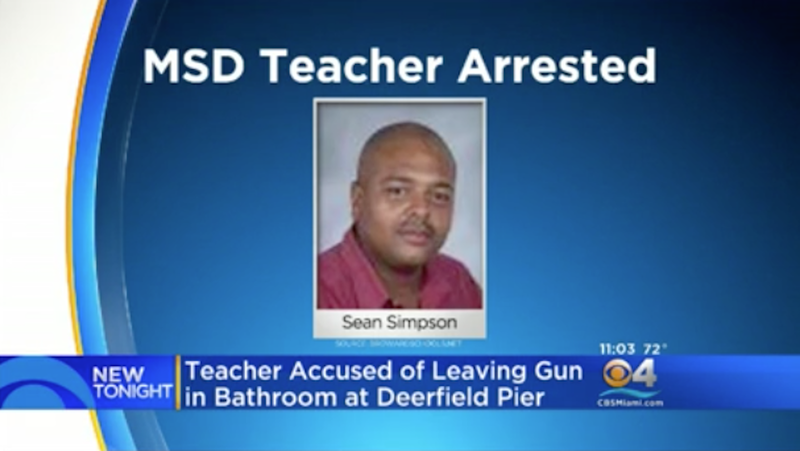 Marjory Stoneman Douglas chemistry teacher Sean Simpson was arrested after leaving his loaded gun in a restroom at Deerfield Beach Pier on Sunday. Police say the gun was found by a drunk person, who fired a bullet before Simpson could wrestle it away from him. Simpson told deputies he’d left his gun by accident. By the time the chemistry teacher realized his mistake, the Glock was already in the hands of a drunk homeless man who had picked it up and fired. The bullet hit a wall. Simpson has a concealed weapons permit, according to CBS News. He was charged with a second-degree misdemeanor for “failing to safely store a firearm,” and posted a $250 bond. The incident is particularly notable because Simpson has reportedly said in the past that he would be willing to carry a gun on campus as a safety measure. It’s not like a teacher would ever be forgetful at work. On Wednesday, Broward County Public Schools, which includes MSD, officially voted against arming teachers.